Buy or gift the new Membership card inspired by Matt Mullican’s exhibition “The Feeling of Things”. Membership cards are valid from the date of issue. The 24-month Membership card offers a 20% discount on the second year. Valid ID must be presented when applying for the Young card. In case of purchase by a minor, a letter of authorization signed by a parent must be presented, together with valid ID. Pirelli HangarBicocca Members are admitted to the exhibitions at a reduced rate (Castello: 4,50€ instead of 6,50€; Castello + Manica Lunga: 6,50€ instead of 8,50€) and receive a 10% discount on the Institution’s publications sold on site. Pirelli HangarBicocca Members enjoy free admission to exhibitions and receive a 15% discount on the Institution’s publications sold on site. Pirelli HangarBicocca Members enjoy 50% off the price of admission to exhibitions. 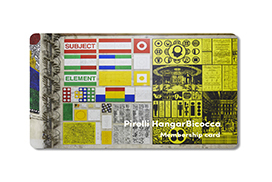 Pirelli HangarBicocca Members are admitted to the three locations at a reduced rate and receive a 10% discount on the Institution’s publications sold on site. Pirelli HangarBicocca Members enjoy reduced-price admission to exhibitions. Pirelli HangarBicocca Members pay the reduced rate for admission and receive a 10% discount in the Guggenheim shops in Venice. Pirelli HangarBicocca Members enjoy free admission to exhibitions and receive a 10% discount on the Institution’s publications sold on site. Pirelli HangarBicocca Members pay the reduced rate for admission. Pirelli HangarBicocca Members enjoy free admission to exhibitions and receive a 15% discount on the Institution’s publications sold on site. Furthermore they can participate to the scheduled guided tours for free (without reservation) and attend the exhibitions’ opening. To take advantage of these benefits, visitors must show a valid Membership card along with ID.